Nicholson PA Water / Mold / Asbestos / Radon Experts! • Disaster Blaster was originally founded and incorporated in Nicholson, PA! • Nicholson was named after John Nicholson, former Comptroller General of the Commonwealth of Pennsylvania from 1782 to 1794. • In 1904, Nicholson founded one of the first fire companies in the area, which was staffed entirely by volunteers. 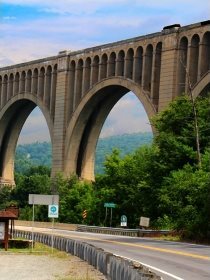 • The Tunkhannock Viaduct, also known as the Nicholson Bridge was built as part of a massive engineering project conducted from 1912 to 1915, and included a smaller bridge known as the Marten's Creek Viaduct, and a 3,630 foot tunnel located 2 miles south of Nicholson. This project cost $ 12 Million. • After the bridge project was completed, the existing rail line was turned over to the Pennsylvania Highway Department, who built the Lackawanna Trail, now Route 11, on the land. This road was opened in 1922. • The town of Nicholson attracted national attention during the final week of July, 1986, when an escaped Bengal tiger was hunted in the area for several days. Despite air and ground searches by state police and zoo officials, the animal was never found.